Authentique Paper and Top Dog Dies are teaming up over the next week to bring you tons of inspiration using Authentique Paper and Top Dog Dies products! Hey everyone, it's Hilary here today sharing with you my project using the "Flourish" collection from Authentique Paper and the "Mini Album Circle Die" along with the "Cherish Doilies and Tags" die from Top Dog Dies. 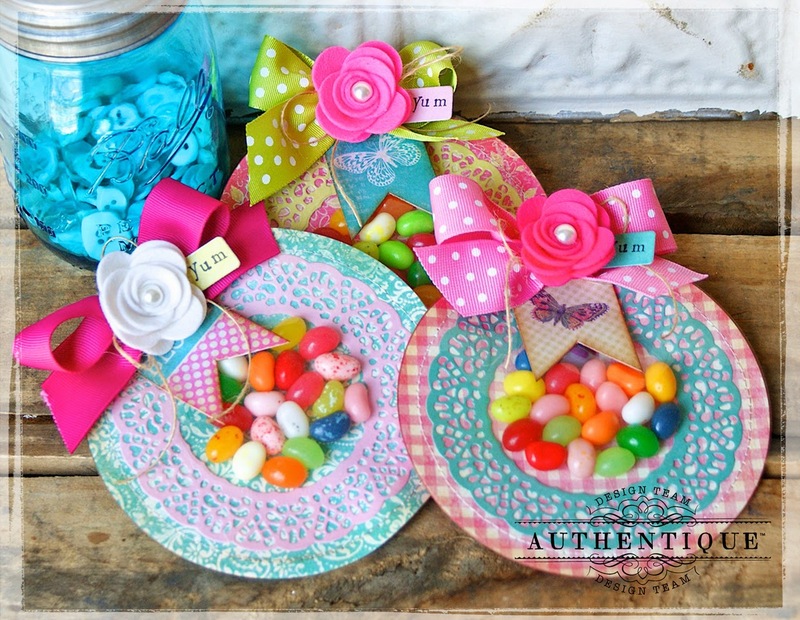 When I first received these dies, I was playing around with them, and it was when I placed the doily on top of the circle, and the fit was so perfect, I knew these would be perfect for a "breakaway" treat bag for Easter. I have many little nieces & nephews that would love to receive these and they are so incredibly easy to make, and then "break" into! They will surely enjoy them...as much as I did making them! 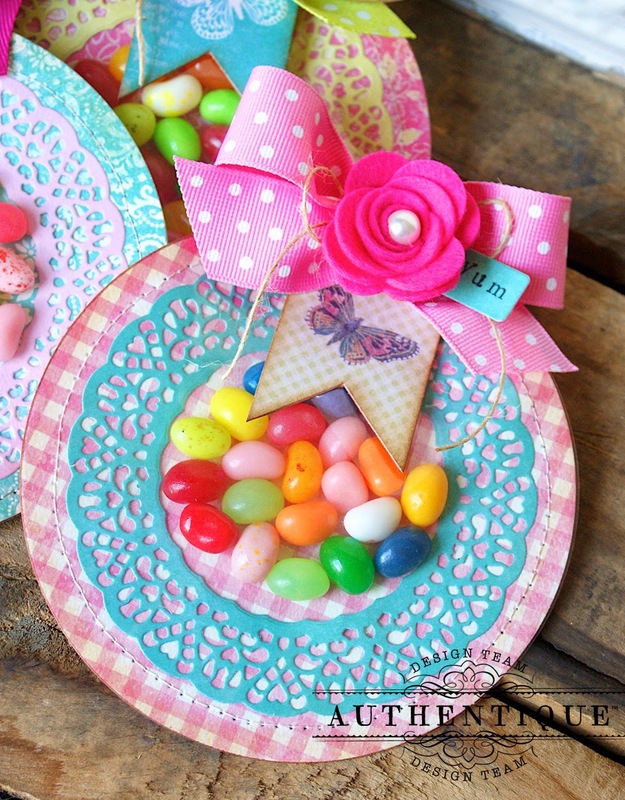 The "Circle" die is seriously the perfect size to for these and the doily just frames the mini jellybeans just perfectly. 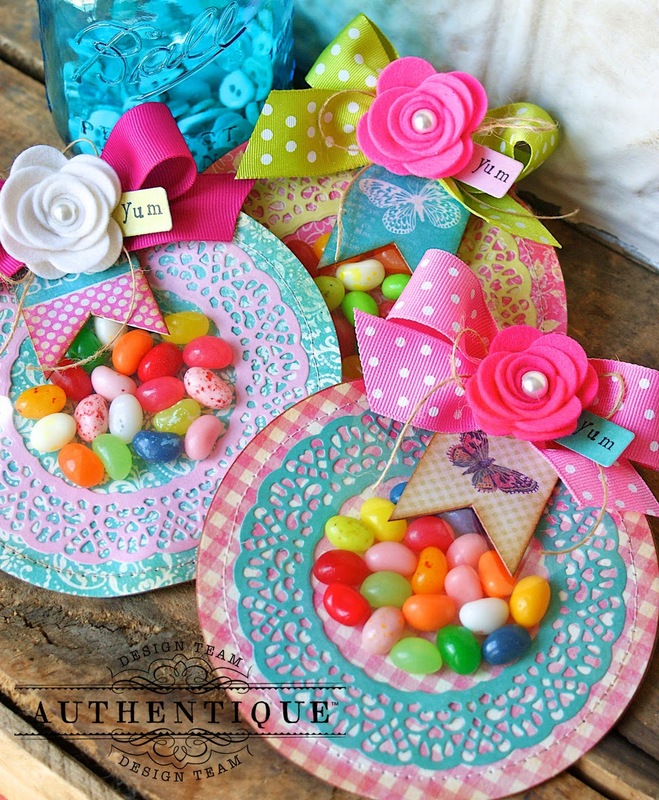 After creating these simply embellish with bows, tags and flowers. To make these, simply die cut as many circles from the "Mini Album Circle Die" as you want treats. Next, die cut transparency paper using the same "Circle Die", then die cut the largest doily from the "Cherish Doilies and Tags" die, the same number for as many treats bags. Tip: Before die cutting the doily, I laid my paper down on Therm O Web's "I-Craft Adhesive Sheets", which are amazing to use when die cutting doilies, because adhesive will completely cover the backing of the doily once it's run through your die cutter, and the protective sheet removed. Then simply lay your doily down on your circle, and press where you want it to stay. Next, machine stitch a transparency circle almost the entire way around, stopping at the top. It's at this point you will add your jellybeans, (or other sweet mini morsel), then stitch the opening at the top closed. 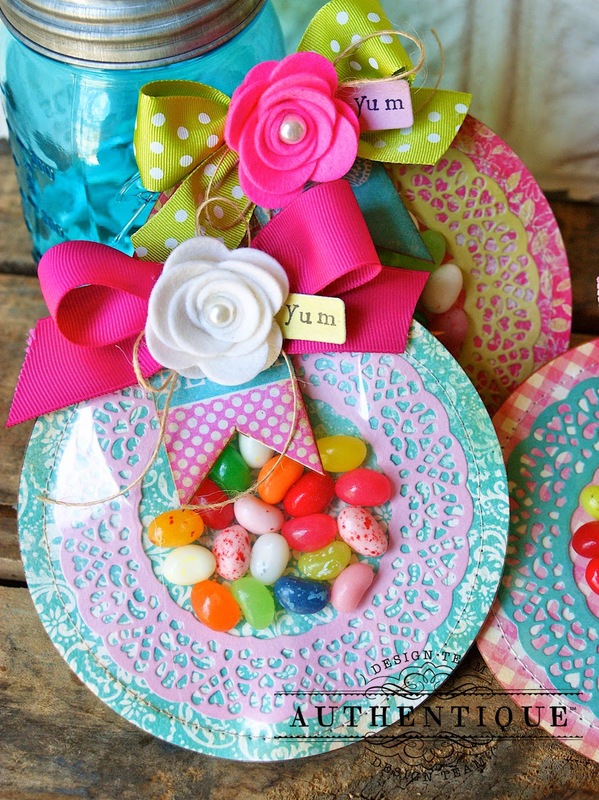 Your project will 'buckle' a little bit, from the jellybeans, so don't add too many. I inserted just enough to cover the inner circle of the doily. Then all that's left is to embellish the top. I simply added a ribbon bow, tags and a felt flower to finish. You can choose to stamp the smallest tag from the "Cherish Doilies" set, and tuck it in the corner of flower if you like! Voila! Simple and sweet and your little ones will love tearing into the backs of these to get to the goodies on the inside. I hope you've enjoyed my project today, and I hope these inspire you to create your own. additional supplies needed: die cut machines, (such as a Big Shot from Sizzix), transparency paper, sewing machine, ribbon, felted flowers, twine, I-Craft Adhesive Sheets from Therm O Web, alphabet stamps and ink, jellybeans. Thank you for the tip about the craft sheets! 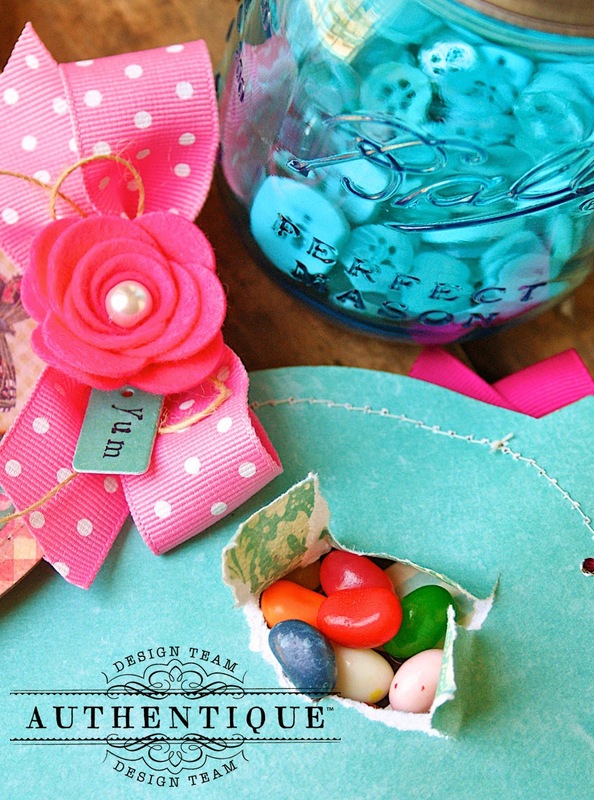 These are adorable... love the fun colors and the beautiful doily die! Beautiful papers and embellishments! That has to be the most clever idea! Love it. The entire project is fantastic. What lovely, adorable and festive cards! that is so fun!, what a creative little treat. Might have to try with some skittles or something. they are so pretty. It seems a shame to tear them up to get to the treat. Love all of the embellishments. Lucky nieces and nephews. This is such a pretty project! I love the pretty doilies and ribbon! Love these treat bags!!! So cute and creative! The Flourish collection is stunning!!! So colorful and fun! Thanks for the inspiration! of the dies for this. Wow! I love those bright colors--the flowers are wonderful! TFS! These are adorable! Thanks for the insiration!!! Cute treat bags! I love the colors, ribbon and flowers. Thanks for sharing. Very cute and colorful and fun to open. The colors are great. But please no candy, lol. So fun & festive! Between the paper & those great doily dies they are great together! So lovely! 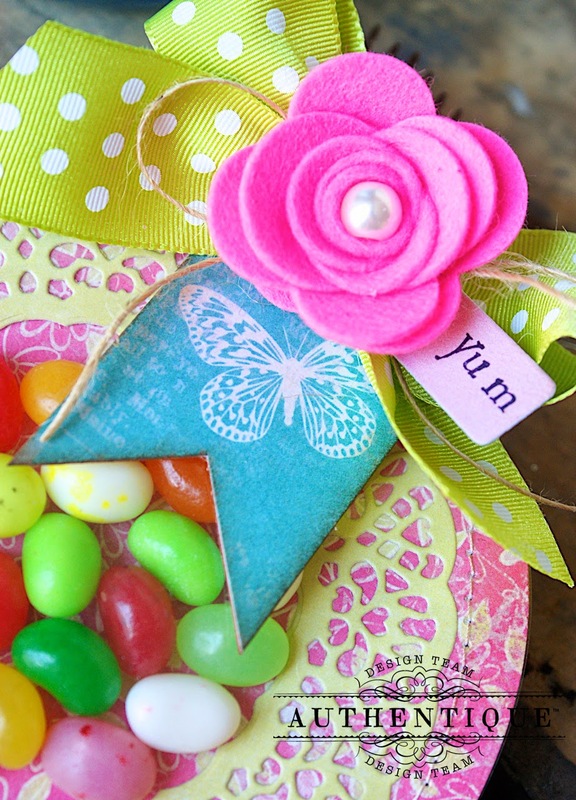 I would love to get treats in these pretty treat bags! Wow these treat holders are a lot of fun. Though I think they are too pretty to tear open. Those are adorable! I really like those felt flowers! The colors a lovely. Perfect for Easter.